Repealing the Fixed-term Parliaments Act? Some commentators, as I have previously noted, still appear to be unaware of the Fixed-term Parliaments Act and think that the PM can call a ‘snap’ election. It is no longer in the gift of the PM to ask the Queen for a dissolution of Parliament. The Queen has now no prerogative power of dissolution. If the PM wants an early election, she has to go to the House of Commons to get a 2/3 majority of all MPs for such an election. The only other route is through the House passing a motion of no confidence (and it has to be a motion of no confidence – not a vote of confidence that is lost); if within 14 days a new government is not formed and gets a vote of confidence, an election takes place. An early election is thus possible, but it is not for the PM alone to determine. Some journalists are now alert to the fact that the Fixed-term Parliaments Act exists and a few appreciate precisely what it entails. However, it is not unusual for reference to the Act to be almost in passing – it can be ‘fixed’ or ‘simply repealed’. The latest example is Peter Oborne in The Daily Mail. It is not clear that those who cover it in this way are cognisant of the provisions of section 2 of the Act. My principal point, though, is in respect of calls for its repeal. The Act cannot be simply repealed or set aside by a vote of the House of Commons. It can only be repealed by another Act of Parliament. This, contrary to the views of Peter Oborne and others, is not that simple. An Act that repealed the 2011 Act and did no more than that would mean that Parliament could potentially continue in perpetuity. Repeal of the 2011 Act does not entail the previous provisions governing elections coming back into force. The Septennial Act 1715 was repealed by the 2011 Act. Section 7 of the Parliament Act 1911 was removed by the 2011 Act. Repealing the 2011 Act does not bring these provisions back into effect. They have gone. There is a dispute about whether the prerogative resumes, but if it does all that means is that Parliament would continue until such time as the Queen agreed to a dissolution. A PM could leave it for some years before requesting a dissolution. In short, a simple repeal is not politically feasible. The measure would have to stipulate the provisions for future elections. One could put the position back to what it was before September 2011, but that has to be provided for in the Bill. Not everyone may agree to reverting precisely to what existed before. Why not stipulate that the maximum life of a Parliament should be four years rather than five? Why not introduce some limits of the power of the Prime Minister to request a dissolution? This does not mean that one could not get the measure through, but it does mean that it would generate debate and likely attempts to amend it. In short, possible, but not necessarily simple. This entry was posted in Uncategorized and tagged Fixed-term Parliaments Act 2011, Parliament Act 1911, Peter Oborne, Septennial Act 1715. Bookmark the permalink. 17 Responses to Repealing the Fixed-term Parliaments Act? As Gerrard Francomb points out, the wording is stipulated in the Act. What you suggest may have been possible under the imprecise wording of the Bill as originally introduced, but it was amended to provide that the motion has to be ‘That this House has no confidence in Her Majesty’s Government’ (s 2(4)). Any deviation from that and it does not count. 1:- If the House of Commons resolves “That this House has no confidence in Her Majesty’s Government”, an early general election is held, unless the House of Commons subsequently resolves “That this House has confidence in Her Majesty’s Government”. This second resolution must be made within fourteen days of the first. 2:- If the House of Commons, with the support of two-thirds of its total membership (including vacant seats), resolves “That there shall be an early parliamentary general election”. So it is not a question of a vote of no confidence or a particular Bill being considered a matter of confidence, the very specific words need to be used. If you had a minority Government the Opposition could spend its time winding up the Governing Party by passing motions of no confidence that do not use the specified wording, thereby saying what they think but not triggering a General Election. I wonder if not being British is an insurmountable obstacle to guessing the answer to this question so I will ask it. Would it or wouldn’t it be a great political handicap for a Prime Minister to raise support for a vote of no confidence in his or her own administration of Her Majesty’s Government simply in order to trigger an election? franksummers3ba: It would obviously be open to criticism, but it is not beyond the bounds of possibility that a PM may try to go down that route. Actually I think, from memory that this sort of thing may have happened in West Germany, once. Both sides wanted an early election, but the Federal President could only dissolve if a no confidence vote passed by the Bundestag. So the opposition put one down, it was debated, opposed in debate by the governing parties, and then when the vote was held the opposition voted for, but the Government members all abstained. Result. I would think the simplest way to go about it would be for Parliament to pass an Act stating that, notwithstanding any provision of law to the contrary (including the Fixed Terms Act) this Parliament may be dissolved by the Queen at any time upon the advice of the Prime Minister (or similar words to that effect – I am not from the UK, much less an expert in its Constitutional law). It could be framed as having no long term legal effects – merely Parliament agreeing to dissolve itself. “Sovereign Parliament” and all that! With Parliamentary Supremacy, Parliament could absolutely do that. They suspended elections entirely during each of the World Wars. They could do even more: they could simply pass a law stating that notwithstanding any other provision of law, the current Parliament is immediately dissolved and a general election shall be held. This was done after several of the Reform Acts (which redistricted Parliament). The only catch is that this would have to be passed by both houses of Parliament and approved by the Queen (who, at least post-Abdication-Crisis, rubber-stamps nearly everything). The Prime Minister doesn’t have a say in, but having backing by a majority in the Commons, is very likely to be able to make this happen. So really the only way the Prime Minister could be prevented from calling a snap election is if *the House of Lords didn’t like it*. What a dreadful mess this is. Imagine the idiocy of a government being completely maniacal, or, as an example, having a Trump or Clinton madness in place, and being unable to throw them and their policies out before a five year term was complete. Who brought this ill thought out notion up? And why? Was this something to do with being part of the Globalist mantra? Even an EU regulation? For aren’t the remaining States in that club being advised to march to this tune? This conscious change to uproot or disturb an entire government procedure has led to embarking on ‘irresponsible government.’ When you uproot part of procedural design you automatically disconnect or destroy the entwined system that worked as a symbiotic approach to sensible or logical government. The best bet is to follow a path that somehow sidesteps madness with a Royal Prerogative. I am at last understanding the need to keep a Monarch. This is the best solution I found on the net so far. Other than the Cromwell approach that is. Slightly off-topic, but I would very much like to hear your opinion on Theresa May’s position that no vote will take place on the outcome of the Brexit negotiations. In particular, how does this work when there will surely be a need to reverse the enabling legislation that enacted the treaties of Rome, Maastricht and Lisbon in the first place? 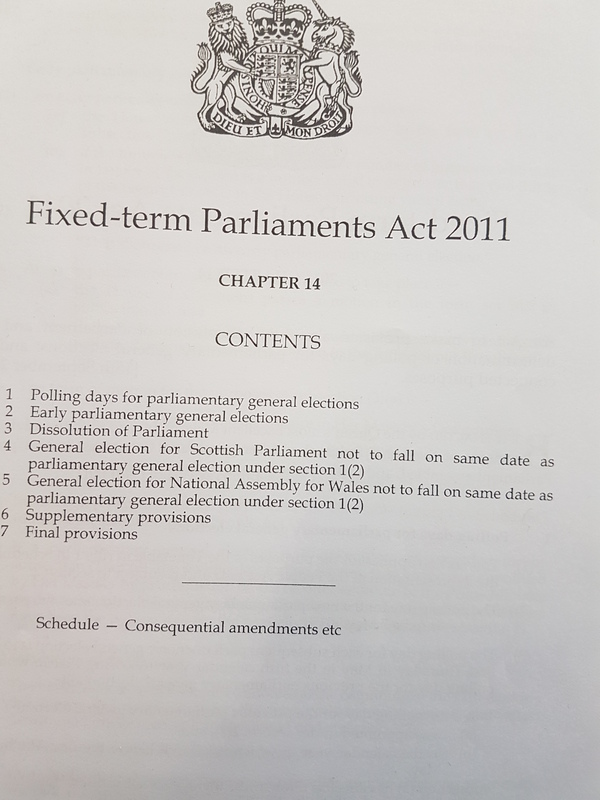 If a Fixed-Term Parliaments Act 2011 Repeal Act 2016 (perhaps it could be called The Quinquennial Act) were to be deployed, could it not simply have a clause to the effect of “The Septennial Act 1715 is reinstated” and similarly list the amendments made to other legislation with the effect of restoring them to their pre-2011 state? Might not the new act even just repeat the text of the old legislation verbatim?